With the annual cold and flu season in full swing, and the bustle of holiday activities and travel, chances are your child will come down with a sore throat at some point. Depending on the source of the infection, a sore throat will either clear up on its own after a few days, or will require a prescription for antibiotics from your pediatrician. Pharyngitis is the clinical term for a sore throat. How can you tell what type of sore throat your child is suffering from? Like regular colds and the flu, many cases of sore throat result from a temporary virus, and will usually clear up on their own after a few days. Managing your child’s symptoms with over the counter pain relievers and cold and flu medication while the virus works its way through the system will take care of viral pharyngitis. Getting enough rest and drinking plenty of water are also important to help flush the virus out of your child’s system, and help them to stay healthy and hydrated while they are sick, and throughout the winter months. Unlike viral pharyngitis, bacterial pharyngitis will require treatment with antibiotics. Most commonly known as “strep throat,” bacterial pharyngitis is usually caused by the streptococcus bacteria. 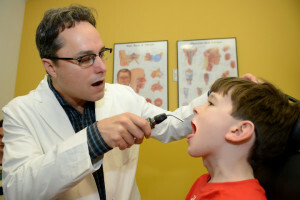 In order to determine whether your child is suffering from strep throat, a pediatrician at Pediatric ENT Associates will perform an exam and order a throat culture, where a swab is taken from your child’s throat and examined for the presence of bacteria. It strep is present, they will prescribe a course of antibiotics to treat the infection. How Do You Know When Your Child is Feeling Better? In many cases, the symptoms of a viral or bacterial infection will clear up before the infection has. It is important to follow your pediatrician’s instructions and take all medication for as long as they are prescribed, especially with bacterial infections, to ensure that your child makes a full recovery and does not suffer from lingering complications or a recurrence at a later date. If your child is suffering from a sore throat, or other signs of cold, flu, or infection, contact a pediatrician in Birmingham at 205.315.5633 to schedule an appointment today! Next, read Is My Child a Good Candidate for a Cochlear Implant?